The Royal Mint has revealed two new commemorative coins to celebrate the 60thanniversary of Paddington Bear’s first adventure in A Bear Called Paddington. This launch is just the start of a series of exciting adventures for Britain’s favourite bear with the Royal Mint. Paddington fans can follow his journey at www.royalmint.com/paddington and #AllChangeAtPaddington. The full designs capture the vivid blue and vibrant reds of Paddington’s famous duffle coat and hat in minute detail – creating two miniature works of art that are beautiful, collectable coins. I for one can’t wait to see these – especially since it’s unusual to have colour on coins. They look like they have some lovely detail in them. 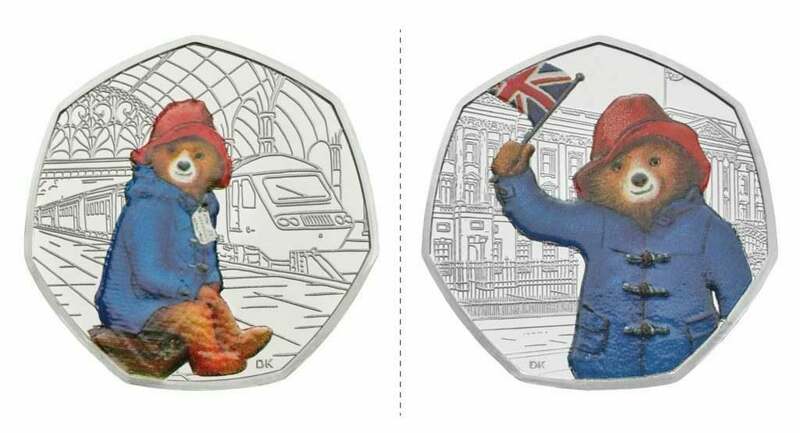 The 50p coins feature Paddington in two of the most iconic locations from his adventures – Paddington Station and Buckingham Palace. Michael Bond, who first created Paddington Bear in 1958, would perhaps not envisaged his bear on a coin as much as on a jam jar. Dave Knapton, Coin Designer at The Royal Mint, was chosen to immortalise the much-loved character for the coin collection and commented: “I loved reading the books about Paddington when I was younger, and felt a real sense of nostalgia as I was designing these coins. Paddington was part of my childhood, but now he’s being discovered by a whole new generation. I wanted to bring his portrait to life and show him in a very realistic environment, so I began with a modern train at Paddington Station, showing Paddington waiting patiently on his suitcase for his new life to begin”. As a brand, the Royal Mint is pretty interesting. It’s obviously serious business, but also has the ability to capture the spirit of the people handling its goods, i.e. the currency, reflecting national pride and being a ‘current’ currency. It’s a step away from historic figures and buildings, but that’s what makes this so appealing in my mind. It’s the perfect excuse to design something different. Anne Jessopp, Chief Executive of The Royal Mint commented: “It’s wonderful to be able to celebrate a character from popular culture as well-loved as Paddington Bear, and the 60thanniversary of the books seemed an appropriate time. I’m sure Paddington would be very honoured to be the first Peruvian bear to appear on British coins”. It’s obviously a collectors’ item rather than general merchandise, but I for one will try to get a set for a rainy day – like Paddington’s emergency jam sandwich under his hat. Bless is furry socks.